Enable or Disable Chat Operators? 1. Login to your Conversion Support account and go to the “Settings” page. 3. Under “Manage Users”, navigate to the right side of the page, hover the mouse over the agent you want to disable and click “Inactive”. This will immediately disable the operator and the agent will no longer be available to login to your Conversion Support account and take chats on behalf of your organization. Should you need to enable an already “disabled” chat operator, follow the same process and hit the “Enable” button next to the chat agent whose status is “disabled”. If you need help with managing chat operators or have a specific question you want to ask, please contact us or write to us at support@conversionsupport.com. How to add operators to your account? Why Do I See “Yet to Install Code” when I verify my installation? 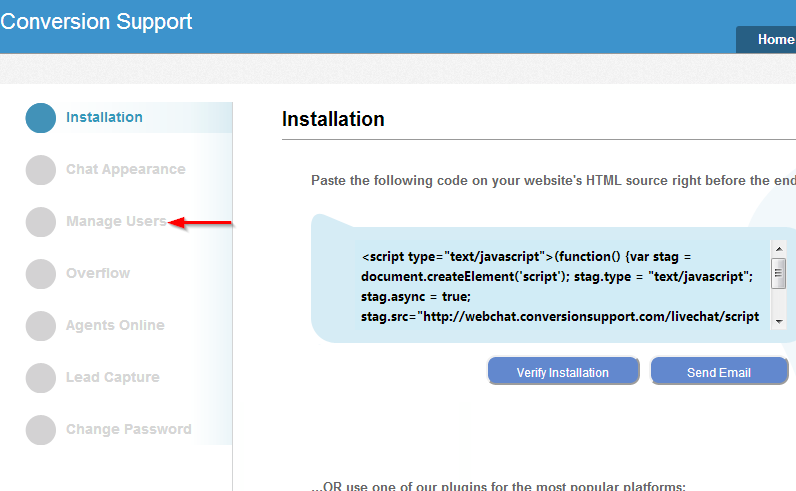 How to install the chat code in my website? Update the email address of an operator? What browsers are recommended to use the dashboard? When I hit “Ready”, it says “You do not have skills to receive chats”.